What's Next For St. Adalbert? What’s Next For St. Adalbert? In May 2016, the Archdiocese of Chicago decreed that St. Adalbert Parish in Pilsen would no longer exist. Instead, it would be merged with the neighboring St. Paul Parish. That October, the Archdiocese announced the intended sale of St. Adalbert Church at 17th Street & Paulina Avenue, home of the parish, to the Chicago Academy of Music (CAM)—a music school with no connection to the Catholic Church. Completed in 1914, St. Adalbert Church and its twin towers have come to define the Pilsen skyline, standing as the tallest structures in the neighborhood. 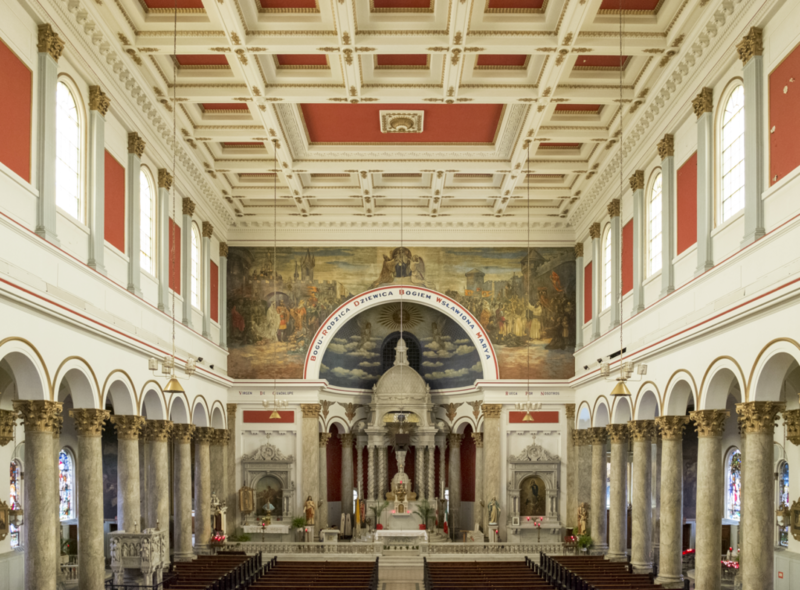 Inside, the church is equally remarkable, with red and white interior walls and stained-glass windows depicting the patron saints of Poland, decor that hearkens back to the 1890s, when Pilsen was a working-class hub for Polish immigrants. Now, St. Adalbert serves a mostly Mexican-American community, holding mass in English and Spanish on a weekly basis and Polish mass once a month. But the sale of the church to CAM would mean that, under Catholic canon law, St. Adalbert would not be considered a sacred site, and therefore would be unable to hold mass. Unhappy to hear that they would no longer be able to worship in their church, parishioners organized as the St. Adalbert Preservation Society and launched a campaign against the Archdiocese’s decision and lack of consultation with the community, as the Weekly reported last March. But at some point last year, the archdiocese’s sale to CAM fell apart, according to representatives from the Preservation Society. The exact date of the termination is unknown, but the Preservation Society received the update last November. In an email to the Weekly, Anne Maselli, a spokesperson for the Archdiocese, wrote, “Although there were many aspects of Chicago Academy of Music’s plan that were attractive, the plan proved ultimately not to be feasible.” Maselli provided no further comment on the termination of the sale. Blanca Torres, spokesperson for the Preservation Society, suggested that CAM might have been unable to pull together the necessary funding for such a large property, one that includes the church, a rectory, a convent, and a school building. “The Archdiocese thought it was going to be a quick sell, but that wasn’t the case,” she said. Michael Carter Scott, founder of CAM, declined to comment. The Archdiocese’s rationale traces back to its plan to consolidate Chicago’s many Catholic churches. In 2016, Cardinal Blase Cupich, archbishop of Chicago, argued that shifting demographics and a shortage of priests have spread the financial resources of the Archdiocese too thin, necessitating several parish closures and mergers across the city. “There is an aging priesthood: You have 171 priests between the ages of sixty and seventy…in fifteen years, [they’re] all gonna be retired,” Greg Sakowicz, rector at Holy Name Cathedral, told WGN in 2016. In Pilsen, Father Michael Enright is in charge of three churches in St. Paul Parish, which was merged with St. Adalbert and St. Ann Parish in February of 2016. That means he holds weekly mass at three separate sites, an undertaking that parishioners acknowledge is substantial. A sale to a secular entity would reduce Enright’s burden and allow the profits from the sale of St. Adalbert to benefit St. Paul. The Archdiocese has not yet disclosed what the final process will be to solicit interested buyers for St. Adalbert, but who the buyer is will ultimately be critical to the future of the church. If St. Adalbert is to remain a sacred site, the buyer must be an organization that has “some sort of Catholic recognition either in the diocese or the Vatican,” according to Torres. The Preservation Society hopes St. Adalbert is handed over to a religious order, such as the Jesuits or the Dominicans. That’s because of an important distinction between clergy in the Catholic church. There are two types of priests: the secular clergy—who are often priests for a particular diocese—and clergy that are part of religious orders, which are not under the jurisdiction of a bishop and therefore have more autonomy. A religious order could therefore take full financial responsibility for St. Adalbert, while also retaining the building’s sacred status and ability to hold religious services. Torres said that selling the church to an order would be a “way for the [Archdiocese] to divest themselves from a property that they think is draining them financially.” Cardinal Cupich would need to give explicit permission for an order to take over St. Adalbert. “The Archdiocese of Chicago is open to interest from any groups, including religious orders,” said Maselli in a statement. Last year, the Preservation Society submitted an appeal to the Congregation for the Clergy, an entity in the Vatican responsible for reviewing appeals from parishioners that have not been addressed by their own archdioceses. The appeal laid out two grievances: the first argued that the Archdiocese’s sale to CAM was a violation of canon law as the church is still considered a sacred site, and the other challenged the closure of St. Adalbert Parish on the grounds that it was unnecessary, given, the appeal claimed, that the parish has a priest, a strong community, and no financial problems. This past December, the Congregation told Torres that the Preservation Society’s appeal will be heard by the highest judicial authority in the Catholic Church, the Supreme Tribunal of the Apostolic Signatura, in November of this year. The hearing will take place after the sale to CAM is no longer in play, and Torres thinks that the latter grievance, against the closure of St. Adalbert Parish, is unlikely to be upheld in the Signatura. But the fact that the Preservation Society’s appeal made it this far through the Vatican is unique. “It is very unusual for the high court to hear a petition for the merger of a parish,” said Torres, who is hoping that the visibility of St. Adalbert’s case at such a high court will establish a precedent for other churches facing similar circumstances. The Archdiocese told the Weekly that any decision regarding the future of St. Adalbert will “reflect the goals and needs of the parish, the property’s architecture and history, its impact on the local community, and the viability of any new owner’s plans to address the significant costs necessary to repair and maintain the Church and property.” And the organizing that has occurred over the past two years—from parish-wide meetings shortly after the church closure announcement, to appeals that have reached the Vatican’s highest court—shows that there is a vocal community of both Mexican- and Polish-American parishioners who care deeply about the future of the church. For her part, Torres remains optimistic. “I think they realized how important St. Adalbert is to people, and they’re looking for the best alternative,” she said. Amy Qin is a contributing editor at the Weekly and a history major at the University of Chicago. She last wrote for the Weekly about a neighborhood’s effort to save a community garden in West Englewood. Three generations of my family were married in St. Adalbert Church, my parents in 1946, my sister in 1970, and my son in 2008. My mom, siblings and I would love for this parish to be able to offer mass as a Catholic Church into the future. But preserving the structure for use by a qualified entity would give us peace as well. i have been praying that St. Adalbert Church would be saved. I was baptized there and went to grammar school there and grew up in the neighborhood where you were defined by the church. The Polish people worked hard and believed. It is a shame that the archdiocese just sees it as a piece of property. It would make more sense to make St. Adalbert the main church while combining it with other churches in Pilsen. The history and architecture alone are worth saving. It is sad what is happening with the Catholic Church and their communities. It is difficult to raise children these days when they hear what is going on in the Catholic Church.